Netel Oy has won the GSM, VIRVE and WLAN system contract for West Metro’s Matinkylä–Kivenlahti section. The contract is valued at around EUR 2.2 million. The project will create antenna networks to serve commercial mobile operators, the Finnish authorities’ network VIRVE and the city’s WLAN network. The radio network contract incorporates the installation and the majority of the materials. Installation will be carried out in the parallel metro tunnels over seven kilometres of rail line, at five stations and in the service tunnels. “Netel was already involved in the construction of West Metro’s Ruoholahti–Matinkylä section. 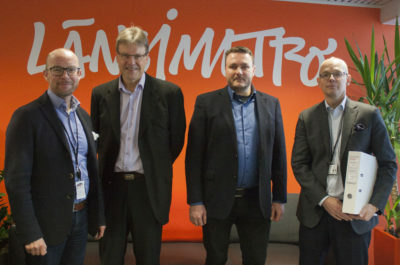 They have demonstrated their ability to create a high-quality end result in challenging circumstances,” says Länsimetro Oy’s Technical Director Raimo Kaunismäki. The system contract is one of 24 subcontracts that extend throughout the metro line. The work is set to start immediately and will be completed by the summer of 2021. “The second phase of West Metro is a critical project for us and it will further increase Netel’s market share in designing and building internal networks,” says Netel’s CEO Ari Asikainen.